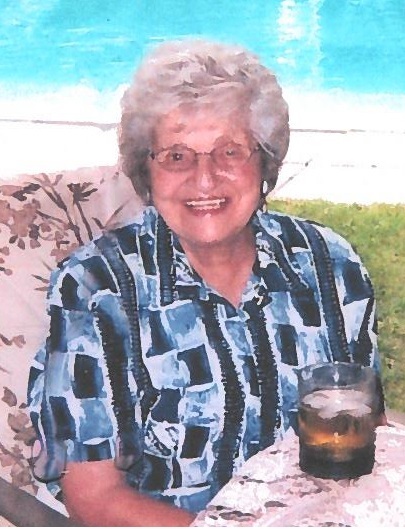 After a full, well lived life, Marg passed away, blessedly peacefully, at the Orillia Soldiers' Memorial Hospital, on Thursday March 28, 2019, in her 94th year. Predeceased by her beloved husband, Eldon "Hoppy" Hopkins. A kind, supportive mother, with a great sense of humour, she will forever hold a place in the hearts of her children, Brian (Barbara Wood predeceased), Diane (Derek Earle), Douglas and Jeffrey (Cathy Zwicker and her children Logan and Skye). Loving and proud grandmother of Devon Earle, Shannon Hopkins (Douglas Ridout) and Mitchell Hopkins (predeceased) and great grandmother of Douglas Rideout Jr. Predeceased by her brothers Ted and Colin. Fondly remembered by her extended Waine and Hopkins family, her vast number of friends and members of Branch 34, Royal Canadian Legion. Visitation will be held at the Mundell Funeral Home, 79 West St. N., Orillia, on Friday, April 5, 2019 from 1 p.m. until the time of Funeral Service at 3 p.m. Interment: St. Andrew's St. James' Cemetery, Orillia. Messages of condolence are welcomed at www.mundellfuneralhome.com. In lieu of flowers, memorial donations to the Canadian Mental Health Association or the charity of one's choice would be appreciated. The family would like express their gratitude to Dr. James Tazzeo, the staff of Birchmere Retirement Residence, Orillia Soldiers' Memorial Hospital, Happy at Home, friends and neighbours for their care and support of Marg in her advancing years. "Dream a little dream of me".